I haven't done an Ohio feature for awhile, so when I found Cleveland's House of Wills in the January/February 2013 issue of TAPS ParaMagazine, I thought it would be a good fit. This is a "lesser known haunt," which I cannot understand because this building is absolutely fascinating! 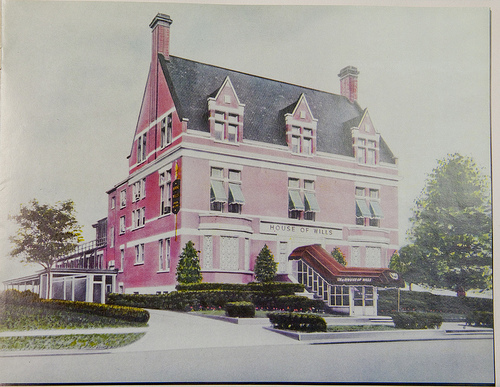 The House of Wills, which stands at 2491 E. 55th Street in Cleveland, was originally built sometime around 1900-1905 and was designed by local architect, Frederick W. Striebinger. It was built as the Gesangverein Hall, a German social club, who formerly met at another location nearby. Later, the building and its several additions, would go on to house the Cleveland Hebrew Institute. There is also reason to believe that the location served as a hospital for Hungarian/Jewish immigrants and possibly as a speakeasy during Prohibition. Where most of the confusing lies is when the building actually became the House of Wills funeral home. John Walker Wills was born around 1875 and was one of Cleveland's most prominent black entrepreneurs of the time period and ran a series of funeral homes with his partner under the name of Gee & Wills. Around 1907, that partnership dissolved and the business became Wills & Sons. Many sites list the fact that Wills owned the building as early as 1905, but other sources say that the business was actually housed at this address starting in 1942 and spanning until 2005. During that time period, the location served as not only a lavish and desegregated funeral home, but also as a meeting place, even being used as a headquarters for Civil Rights Movement meetings, as Mr. Wills was quite active in the cause. The building also served as Mr. Wills' home, until his death. He died in an upstairs bedroom on April 23, 1971. He was 96 years old. He is buried in the Lake View Cemetery. The House of Wills stood abandoned between 2005 and 2010. It was in a rough neighborhood, so the elements, as well as vandals, took their toll on the aging structure. In 2006, a man was shot and bled to death on the front doorstep of the House of Wills, making him the last confirmed death at the address. Then, in March of 2010, local artist Erich Freeman purchased the House of Wills in hopes of restoring it for the purpose of art shows and exhibitions. It's during this time that the building hosted a number of paranormal investigation groups eager to seek out claims of the paranormal. The House of Wills is home to reports of phantom footsteps, strange mists, and shadow people. Visitors have claimed that a disembodied voice calls their name out to them. In one incident, someone reported an energy vortex in the old casket room. Others see a full-bodied apparition of a gentleman dressed in a suit...possibly the ghost of Mr. Wills himself. Does Mr. Wills walk the halls of his former home and business? Are the souls of those who died at the location when it was a hospital still roam its many floors? Or...is it the spirits of the many people who made their final stop here before final burial?